To analyze the result of the MDX query with Kettle is complicated (you need for every number of columns a separate transformation) but is possible. In these days other Pentaho frontend tools are able to process this direct via OLAP4J. I tested this with the Webservices step (using Basic Authentication) and for specific usecases this would be an option. Further development brought the OLAP Input step and this simplifies a lot and was tested successfully. Discover – This method is used to query metadata and master data (this corresponds to the BAPI MDDataProviderBW). Execute – You can execute MDX commands with this method to receive the corresponding result set (this corresponds to the BAPI MDDataSetBW). 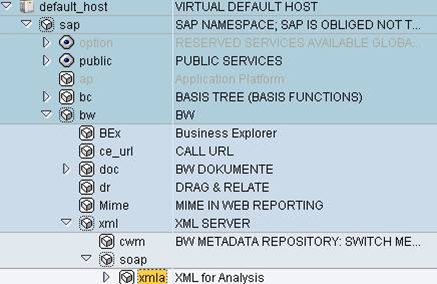 For XMLA with SAP BI you have to create MDX commands generated from the metadata you receive from the system. Some syntax templates are available in the MDX test editor. The output will be in format of Datasets: AXIS_INFO (Metadata description of the characteristics, attributes, and structures on the axes), AXIS_DATA (Characteristic values, attribute values etc. ), CELL_DATA (Value cells: The cells are arranged by row first, and then by column), TXT_SYMBOLS (Text elements for the query). Unfortuneatly all screen shots or data samples I have are from a real system but I hope some of the information given here are useful nevertheless to set up the SAP side. Thanks to Paul Stoellberger, who continued to work on this. He provided me with some screen shots for Pentaho Analysis Tool (PAT), Pentaho Reporting and Kettle accessing a SAP BI system.